Americans love their pies. From homemade apple pie to pumpkin pie, there’s hardly a diner scene in a movie where someone’s not seen devouring a slice of pie. It’s even more prevalent with special occasions such as Christmas and Thanksgiving. Pumpkin pie has been the inspiration for many an autumnal brew. This year’s first release was all the way back in June and was followed up by countless others. Pumpkin beer is not just for Halloween and takes in Thanksgiving and the remainders are supped over Christmas along with pie for desert. For Christmas this year, desert featured chocolate pecan pie. Pecans are a southern US tradition and in Ireland they only tend to pop up in Cuisine de France pastries. Thus year gave me the opportunity to try some pie with a beer made with whole roasted pecans. Lazy Magnolia is Mississippi’s oldest brewery (well post-prohibition speaking) founded all the way back in 2003. They produce a nut brown ale called Southern Pecan, which has a few awards to its name. The beer (4.4% abv) pours burnished copper with a slight head that forms a band around the rim of the glass. It’s a malt forward beer (19 IBUs) and its aroma picks up roast vegetable notes with a liberal sprinkling of brown sugar. In keeping with its name, there’s a big hit of pecan on initial tasting with sweet nuttiness on the finish. 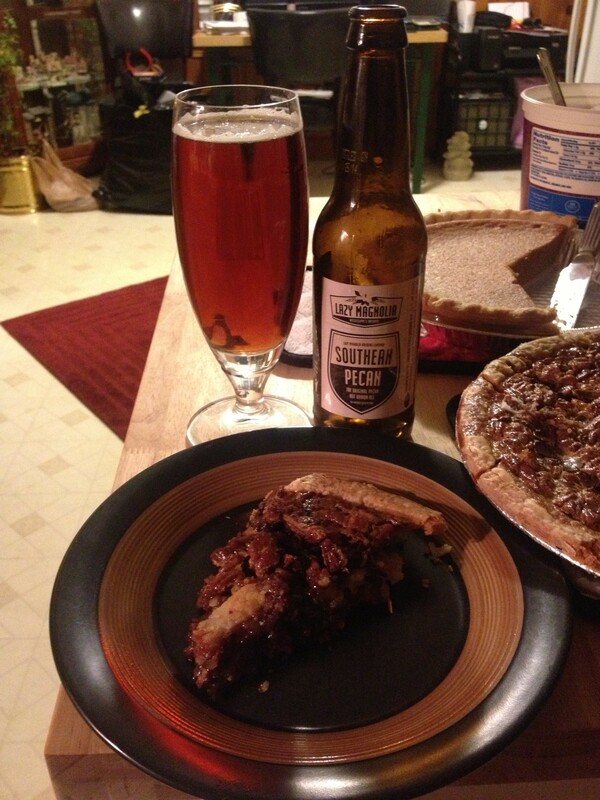 While the beer’s fairly light in body, it comes into its own with a good ol’ slice of pie.